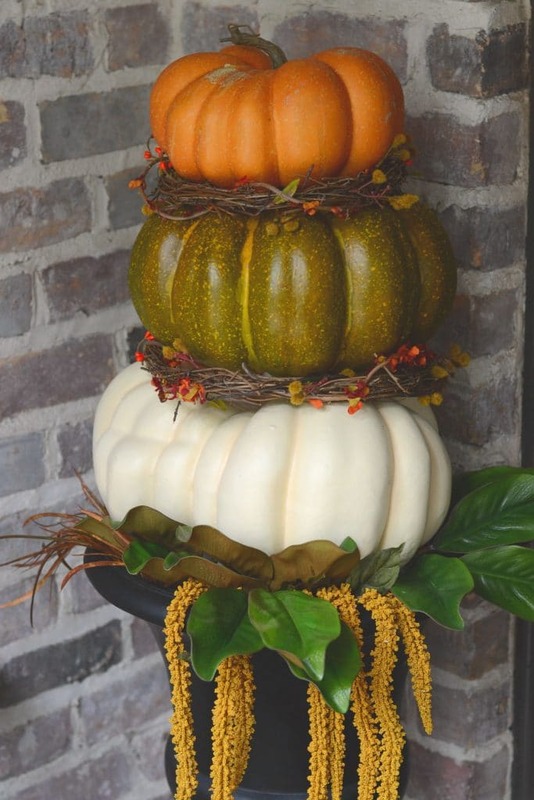 This DIY pumpkin topiary (made with faux pumpkins) is a beautiful and easy way to decorate your porch or patio for fall. You can customize your topiary many different ways to match your personal style and your decor. Read below for a full tutorial. Since we were dealing with flooding from Hurricane Harvey last fall, this is our first official fall in our new home. I have been one of “those” people going crazy over the fall decorations and craft supplies that have begun popping up in stores and catalogs over the last week or so. One of the first things that caught my eye was a pumpkin topiary, which I originally saw in a beautiful home decor catalog. I adored the topiary, but I did not adore the price, which was almost $300 without the planter! So, I decided to take a stab at making one of my own. I absolutely love how it turned out, and now I’m going to share my process so that you can make one of your own. Because it’s made with faux pumpkins, this topiary is a worthwhile investment of your time and money — it can be used over and over again, year after year. The other wonderful thing about this project is that you can make it completely customized. 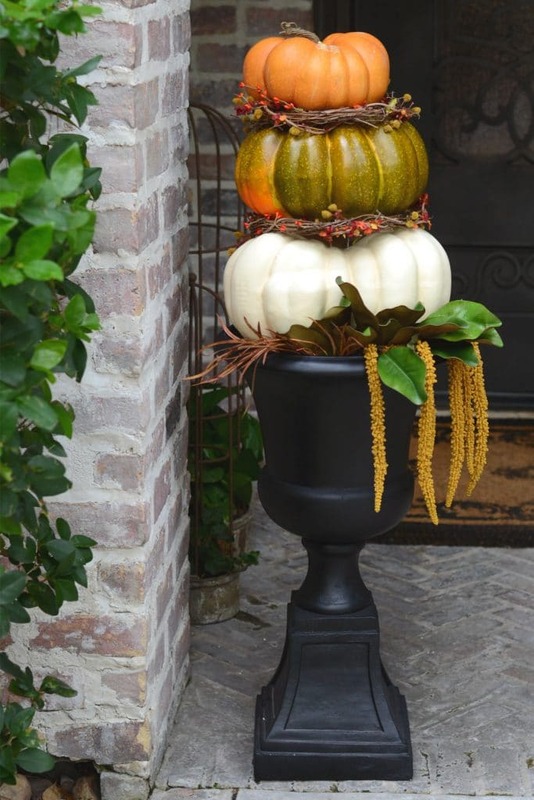 Your pumpkin topiary can be large or small, embellished or minimalist, glitzy or rustic. Go hog wild or make it on a shoestring budget! You can complement your decor and your personal taste by choosing materials that speak to you. **I purchased my pumpkins at Michaels. If you have trouble finding foam pumpkins that you like, you can choose pumpkins made from another material. 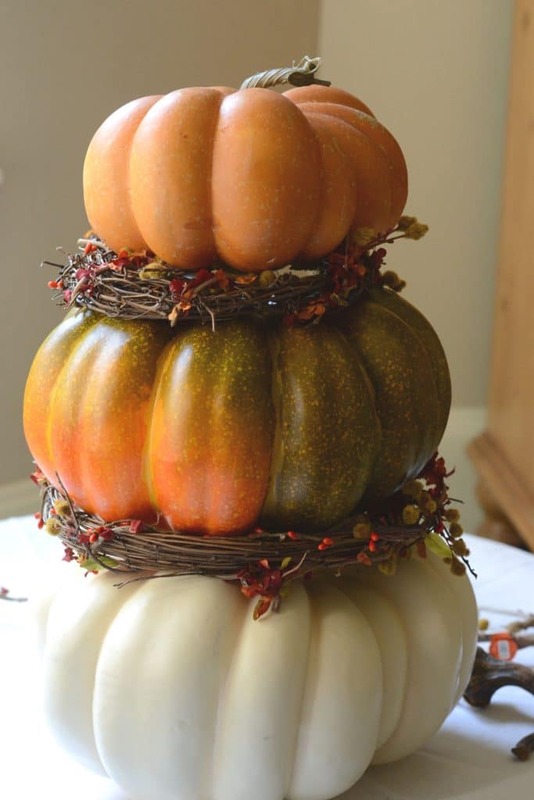 Just make sure that the stems can be removed on the large and medium pumpkins, so that they will stack properly. I prefer foam pumpkins because it’s easy to carve out the stem, and to piece them together using a skewer. The first step is to find your pumpkins because the size of your largest pumpkin will determine the size of the planter you’ll need. I recommend shopping for your pumpkins first, and then choosing a planter. Of course, if you already have a planter you plan to use, then just measure the top and choose your bottom pumpkin accordingly. Remove the stems from the bottom two pumpkins. You may just be able to pull the stems off, but if they are attached securely, you’ll need to use a sharp knife or a hot knife. Fill in the planter with newspaper, plastic bags, or packing foam to help prop up the bottom pumpkin. 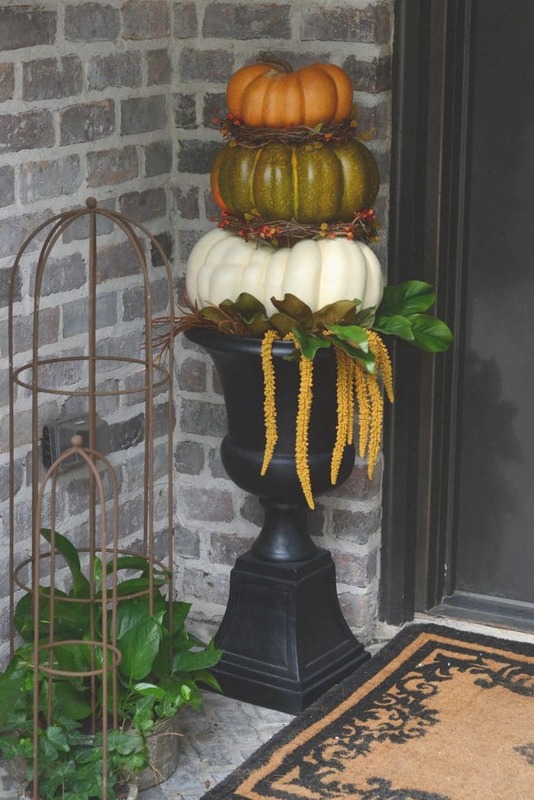 Add some faux greenery around the perimeter of the planter to create a “bed” for the bottom pumpkin to sit on. I personally like the look of some cascading florals or greens (such as ivy) combined with some shorter leaves or stems. 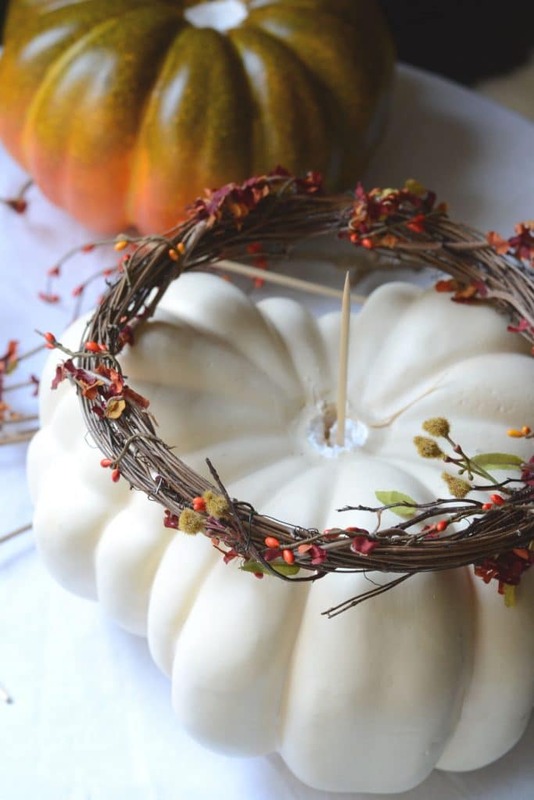 Create a round “wreath” out of the grapevine garland that will fit between the pumpkins. 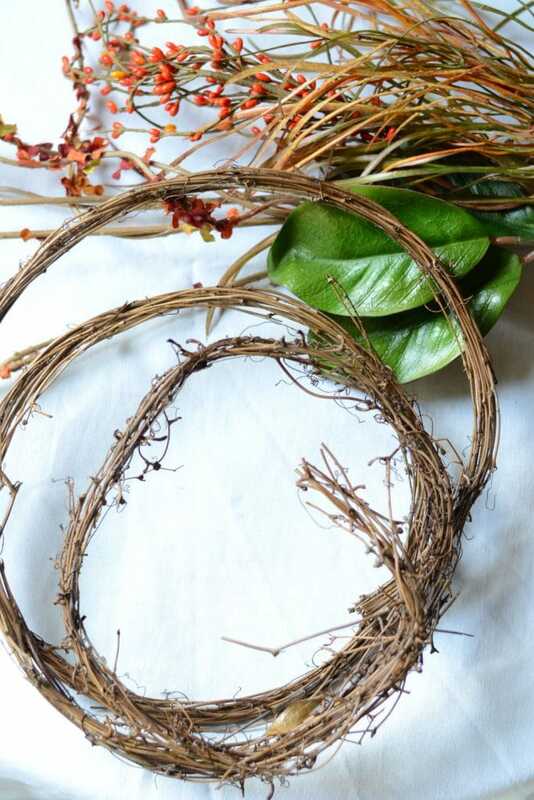 Use floral wire to bind the grapevine into the circumference you need. Add embellishments to the grapevine to add color and texture. Floral craft picks or additional garland can be wrapped around the grapevine and tucked into the branches or attached with floral wire. Get as creative as you’d like! I use floral wire cutters to cut individual branches off of faux floral picks and branches. It’s easier to work with the smaller pieces, and they can be more easily wound around the grapevine garland. Stand back and admire your work. Because this topiary is not held together by glue or any permanent binding, you can always go back and rearrange, add more, take away, and fiddle with it until you absolutely love it! If you make this project, I’d love to see it! Post a photo of your creation on Instagram and tag me at @goodinthesimple. Any questions? Just email me or comment below.